The handwriting readiness lessons on this page are for children who need to practice writing the basic shapes of the printed letter. My daughter did these lessons in kindergarten. Each file labeled Week # contains 4 printable worksheets. A suggested 5 week schedule is included below. 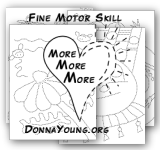 The files labeled "Fun" contain one printable worksheet each. An award certificate may be printed. A suggested schedule is below. Week Three - Handwriting rule is added starting this week. 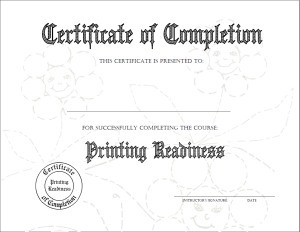 Printing Readiness 2 has 23 printable drawings. Parts of the drawings may be traced to further aid the student with pencil control.